NSDate return “1604” for year value? I'm try to get birth data for contacts but if user does not choose year or the contact come from Facebook and the year or the data it self is hidden so it give me the "1604" value for the year u can see what i mean in the image. Congratulations, you've discovered an implementation detail! When you're talking about Address Book, it is unlikely that you'll have anyone in your address book who was born in 1604. 1604 was a leap year (by the rules of how leap years are calculated), which means that if the person whose birth year you don't know was born on February 29th, then 1604 could handle that, too. 1604 was before the Julian-Gregorian calendar switch. Thus, if you're pulling birthdates out of Address Book, you'll need to special-case 1604 as the "birthdate where the year is unknown". Note: To my knowledge, this is only supported when dealing with the Gregorian calendar. 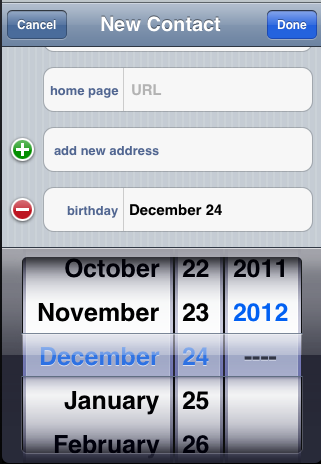 For all other calendars, this behavior is undefined. You can init the year in viewDidLoad. Or check if the year was not chosen by the user, present error message. Not the answer you're looking for? Browse other questions tagged iphone objective-c ios nsdate abaddressbook or ask your own question. Save kABPersonBirthdayProperty to the address book without a year? How to compare two NSDates: Which is more recent?